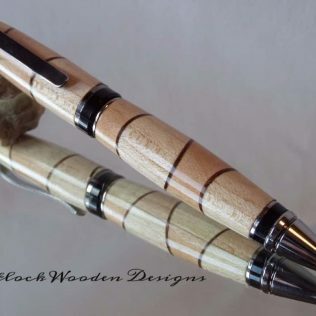 Choose from three segmented wood pens handcrafted on the lathe in my own UK workshops. 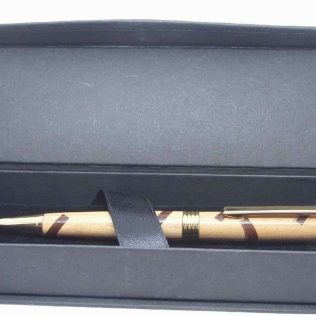 These segmented pens all have a twist action mechanism with a high-quality 24 carat gold-plated trim. 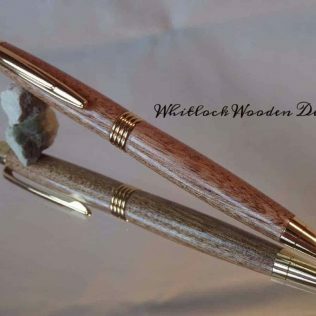 The handcrafted wood pen barrels are hand turned from different types of woods Bubinga and Cherry, Cherry and Walnut or Cherry and Wenge. 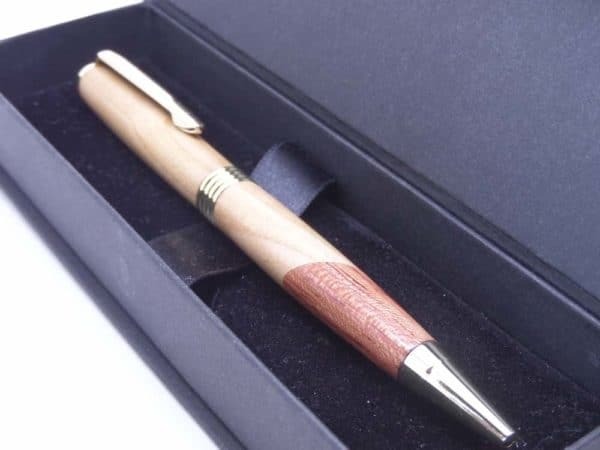 The pen design has an overall length of 134 mm tapering to the ballpoint and top of the pen from the four ring centre band. 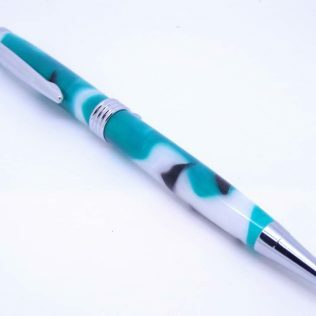 These unusual segmented pens offer endless possibilities with all the different colours, patterns. I hand turned the wood to round and shape on the lathe. 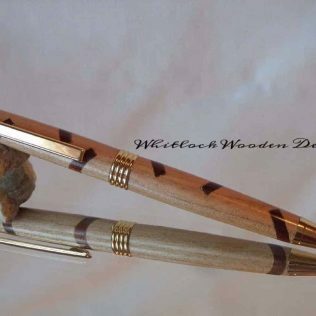 Once shaped and sanded the pen needs finishing with super glue for a hard and durable high gloss finish. 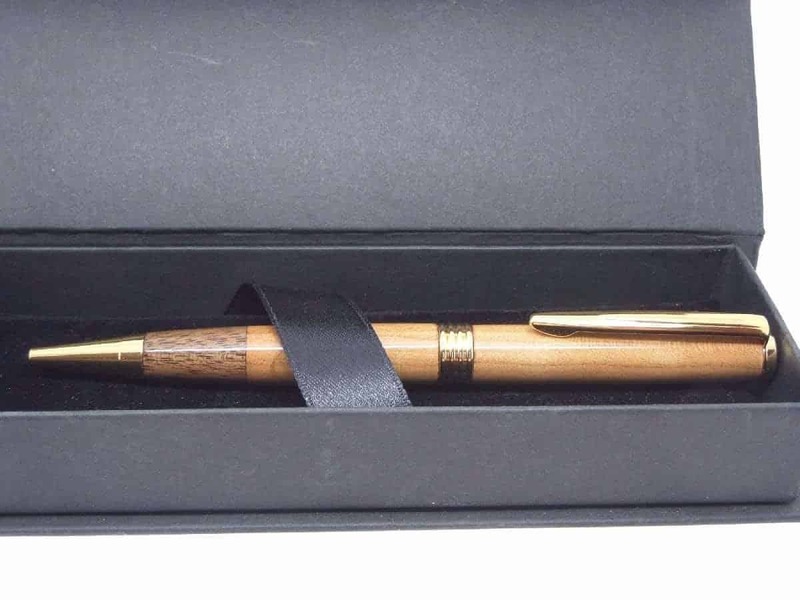 Each wood ballpoint pen uses a cross type medium ballpoint black refill available from any good stationery suppliers. 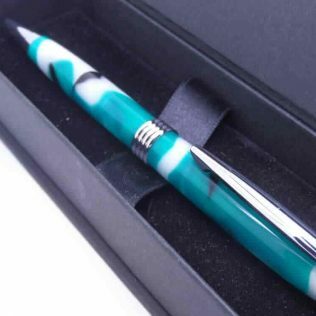 All my ballpoint pen gifts come in a presentation box as standard. 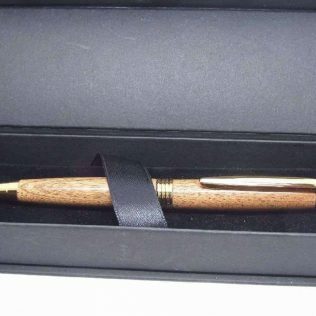 As every piece of wood is different these pens make unique wooden 5th wedding anniversary or Birthday gifts. 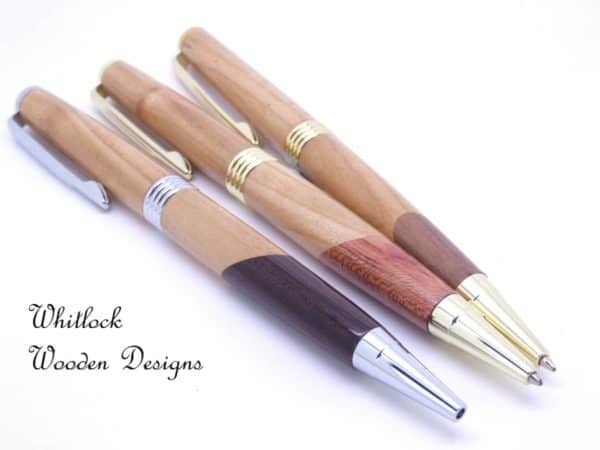 Whitlock Wooden Designs treats the delivery of all our customer orders as a priority. We want you to receive your order as quickly as possible, so you can enjoy it. We aim to dispatch all orders the same day as placed, provided we receive it before twelve o'clock midday GMT. We offer 1st or 2nd class signed and tracked postage. 1st class for £4.95 and 2nd class for £4.0 with up to two pens throughout the UK. Free shipping available for all UK orders over £60 only. This free service is our second class postage by Royal Mail normally two day's delivery. We dispatch orders to America and Europe too with up to two pens for the price of £11.00 signed and tracked. Rest Of The World. Also, we dispatch to other countries for £11 with mail tracking where ever possible.